Visit here for a full list of WGL Energy Wind Power Partners. For more information, contact your WGL Energy business development manager or lgc@wglenergy.com. For millions of Americans, the holidays are a time of travel, feasting and shopping. For family and friends, it is a time to reunite and give thanks. 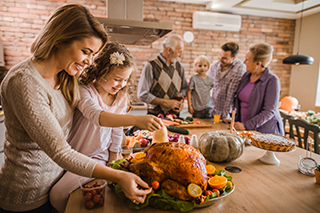 This season often comes with increases in spending and energy consumption due to the colder weather and increased appliance use, but there are ways to reduce waste and lower your energy bills. Letting people serve themselves rather than proportioning food can prevent food waste because people can take only what they want to eat. Storing leftovers in the freezer can keep the food longer. If there are extra canned goods, consider donating to food banks or charities so nothing goes to waste. Make sure to choose the right cookware for the dish to ensure proper, efficient cooking. When cooking large quantities of vegetables, consider steaming as this uses less energy compared to oven roasting and stovetop cooking. Keep your fireplace damper closed unless a fire is burning. Turn down your thermostat at night or when no one is at home. Lowering the temperature by 10 to 15 degrees during these periods can save around 10% on your annual heating and cooling bill. After the meal, loading the dishes into an ENERGY STAR-certified dishwasher can save time and energy. ENERGY STAR-certified dishwashers uses less than half as much energy as washing dishes by hand. Doing the laundry in cold water can also help the environment and save energy, just be sure to check your clothing label first. For more ways to save on energy costs and energy efficiency solutions, visit our Energy Insights library on our website. WGL Energy delivers a full spectrum of energy offerings, including electricity, natural gas, renewable energy, carbon reduction, distributed generation and energy efficiency provided by WGL Energy Services, Inc. and WGL Energy Systems, Inc.
WGL Energy strives to provide concise and accurate information from dependable sources for information contained in this report. Nevertheless, WGL Energy does not warrant the authenticity of such information. This report is not intended to serve as a trading tool for customers or for potential customers. If you would like to like to receive this information via email, please send your request to lgc@wglenergy.com. To ensure delivery of the ENERGY UPDATE, please add lgc@wglenergy.com to your email address book or Safe Sender List. If you are still having problems receiving our communications, see our white-listing page for more details.